« Day 40 in Beijing: The Sky is on Fire! I’ve written about the amazingly efficient subways in Beijing. They are, how do I put this, more, uh, eclectic. I needed to buy some essentials at IKEA and decided I’d take a city bus this time. I previously had used a cab to get there and that was an easy 15 minute ride. The price was about 4 bucks American so cabs are a great deal here in Beijing. I decided to try something adventurous and take a bus. 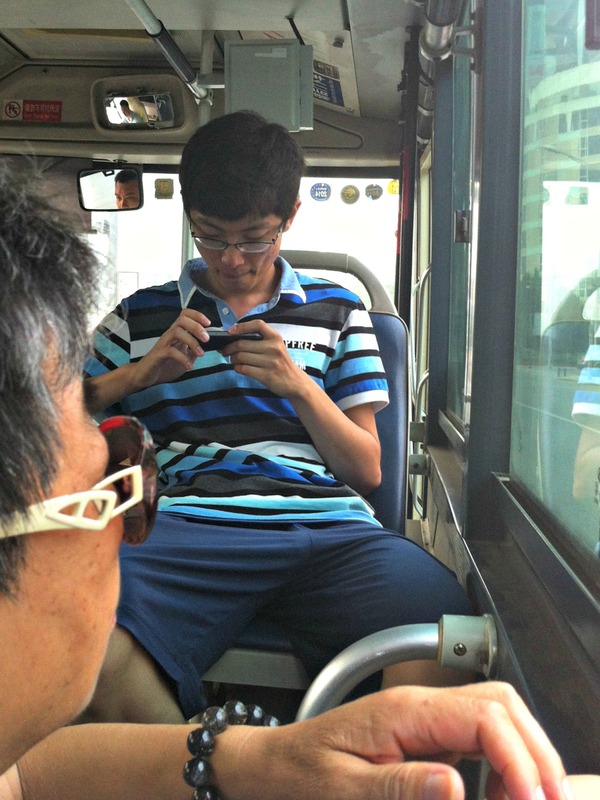 Why is a bus ride adventurous? It is all in Chinese script and it is more than likely that the bus driver won’t speak any English. Luckily, one of my coworkers helped me by printing out an excellent map of how to get to IKEA and then how to grab another bus to get home. I’m in her debt and feel very lucky to work with such wonderful people. The busstop. I was taking the 536 which is at the bottom. Pretty much everything is in Chinese. She also suggested I use Google Maps. I was surprised because I would have thought Google Maps wouldn’t have been available but the app opened right up and I typed in IKEA and it gave me the same bus directions that she had printed out. The timing, however, of Google Maps in regards to when the buses show up and drop one off were, uh, again, eclectic. I waited about 20 minutes for the 536 bus to pick me up and when it did I hoped on, used my bus/subway card and took a seat near the front. 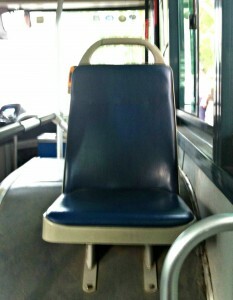 I noticed this backward facing seat that is a useful space saver since the tires take up so much space in the bus. This seemed very intelligent and reasonable to me…and then the bus filled up. I’m guessing you can see what might be the problem of sitting in this seat or the one facing it. I thought maybe this wouldn’t have been a fairly awkward trip if I was sitting in this lady’s seat. She spent the whole trip looking out the window. I would have done the same. Buses in Beijing stop at every stop. In the San Francisco Bay Area, riders have to push the “stop” button so the driver knows to pull over and let a rider off the bus. It made it less stressful because I knew it would stop in front of IKEA and I could just hop out when I saw that famous blue and gold building beside the road. The ride only took about 15 minutes since there wasn’t any traffic and it was easy. I lined up to get off as the bus came to a stop and simply walked right off. I was surprised at how quickly the bus arrived at IKEA and will definitely take it again if I need to do more shopping here.